Data transmission with 10 Gigabit Ethernet (10 GbE) requires the harmony of all the components of a cabling system. If one part moves unexpectedly, there can be interference in the data stream. More information on the risk factor of cable dynamics. What happens when cables move? The more high frequent the data transmission, the more sensitive the network. Even the slightest movement can impact the transmission characteristics of copper conductors. With the highly developed 10GBase-T transmission, this can actually lead to data packets being lost. 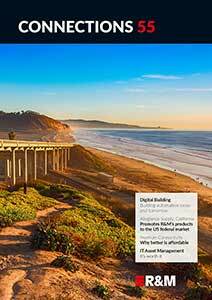 The effect – referred to as “cable ­dynamics” by the IEEE – is currently giving rise to a lot of discussions among experts. The R&M development team at HQ in Wetzikon has taken a closer look at this effect. It is thus doing some spadework in preparation for the development of a standard. The first results from random tests with cables from a whole range of manufacturers are already available. With 60% of the products, cable dynamics led to short interruptions of the 10 GbE data stream and even to temporary data packet loss. 10GBase-T automatically adapts to changed transmission conditions after a certain amount of time. 10-Gigabit functionality is usually guaranteed once cables stop being moved. Users have to decide: Should they accept short-term, unforeseeable data packet loss? Or should they do everything in their power to minimize this? You can keep cable dynamics under control by selecting suitable cabling components. Unfortunately, you cannot yet see just by looking at a cable how stable its transmission behavior is going to be when it is moved. The only solution is measurements and the introduction of a new test parameter for cable dynamics. Well-conceived construction features, such as the outstanding strain relief of the Cat. 6A modules and the patch cable connectors from R&M, avoid mechanical loads at the relevant points. R&M is developing valid test procedures and is taking a closer look at the entire range. 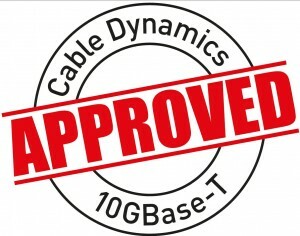 The idea is to introduce an “Approved 10G Cable Dynamics“ quality seal.